Ready to try Hot Tent Winter Camping? Fire up the wood stove and go winter camping in style. With a hot tent you’ll have a home to warm up in, you’ll get a hot meal before bed and another one in the morning. 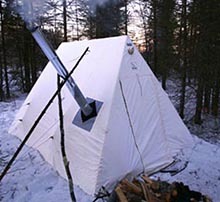 Discover the joys of winter camping in a hot tent. Wilderness winter camping in style – pack it all up on a Pulk (a tow behind sled) and move it down the trail. Rental Tents and Pulks for your next adventure.